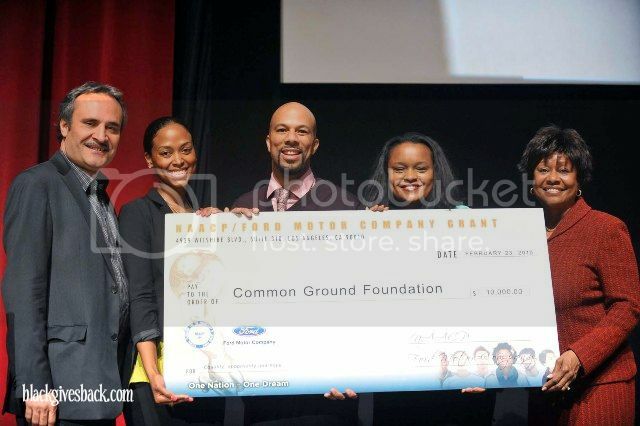 Hip hop artist, actor and children's book author Common receives a $10,000 donation from the Ford Motor Company to support his foundation, the Common Ground Foundation at the NAACP Image Award Symposium last month in Los Angeles. Pictured in photo: Vicangelo Bulluck, Executive Director of NAACP Hollywood Bureau, Image Awards Producer and Panel Moderator; Rhea M. William, Executive Director of Common Ground Foundation; Common, Pamela Alexander, Director of Community Development and Fund Operations, Ford Motor Company Fund; and Clayola Brown, Chair, NAACP Image Awards Committee. The Foundation's website states that their focus is empowering youth in urban neighborhoods and providing life skills needed to achieve their dreams. Visit the Foundation's website at www.commongroundfoundation.org to learn more about their programs and initiatives.